Did You Know? Organic Search and Local Search Are Related. Is Google The New Homepage for Local Businesses? Consumers are searching online more than ever before. But local businesses may actually be seeing less web traffic. How is this possible? “Local search” often starts with Google and there are now numerous ways for consumers to find all the information they need right on Google’s first search results page. Google even allows consumers to interact with a local business – all without ever going to a website! This is all enabled by Google My Business listings that are becoming an increasingly vital component in creating online marketing success and attracting new customers. In fact, a new MOZ report found that 64% of local business marketers agree that Google is becoming the new “homepage” for local businesses. Search used to be all about getting a click to your website. Now, it’s also about getting a click to a Google My Business listing. Websites are still important, but keeping your Google My Business and Knowledge Panel up to date is no longer just nice, it’s absolutely necessary. If you don’t, you’re missing a huge opportunity to promote your business. What is the Knowledge Panel? When a consumer conducts a search for a particular business, Google provide the most relevant results as well a box on the right side of the page that is called the Knowledge Panel. The Knowledge Panel for that business includes directions, phone numbers, hours of operation, and more. Knowledge Panels show up in roughly 40% of searches and are especially crucial for providing consumers actionable results not requiring any additional clicks. You can keep your Knowledge Panel information relevant and up-to-date by first claiming, then verifying, your Google My Business profile. Google My Business is a free, easy to use listing that determines what appears on the Knowledge Panel. This will ensure that your customers can find and contact you, in addition to providing an overview of your products or services. Perhaps most importantly, the Knowledge Panel aggregates consumer reviews, making your online reputation readily available to all consumes. Managing your Google My Business listing, and Knowledge Panel, has become indispensable to online marketing success, as well as putting your business in the best position to get found. 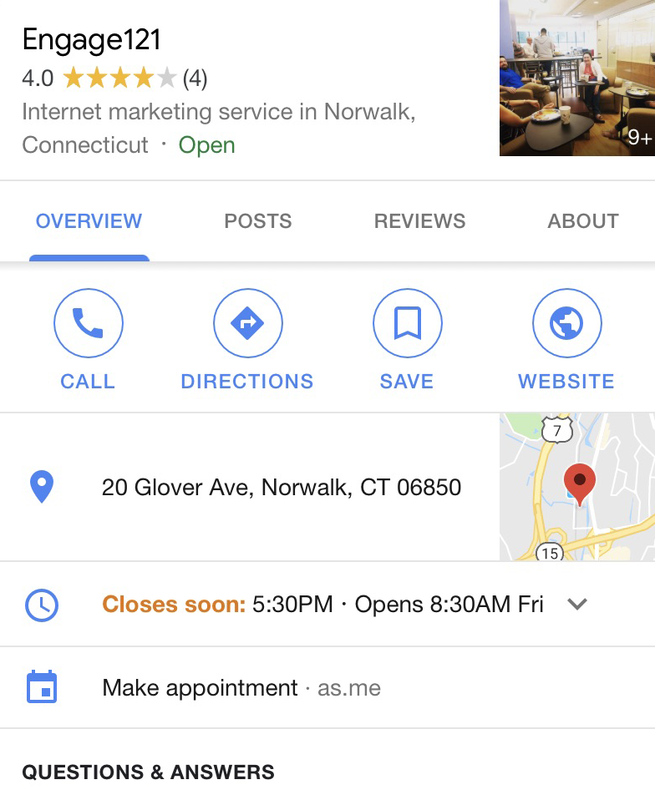 Claiming and verifying your Google My Business listing requires a bit of know-how, and we’re here to help -- contact us for more information on how to get started. INSIDE TIP: Subscribers to Engage121’s free HOT!Content service can access our 1-click Google My Business claiming app. Enroll here to get started. Good local marketing in the age of Google is no easy task. But doing it right can deliver some of the best returns for your local business. Interested in learning about how we can help manage your local Google My Business listings, and more? We’d love to talk. Learn more Related Services HOT!Content – a no-cost Daily Email with content and DIY tools. Digital Marketing Assistant, (DMA) – a managed subscription service. How Is Your LOCAL SEO? What’s Different About LOCAL SEO?